Food for Thought! : Mars and Buffett bid $23bn for Wrigley. Mars, the world's largest chocolate maker, and the investor Warren Buffett confirmed on 28th April 2008 that they would pay $23 billion (£11.5 billion) cash for Wrigley in an agreed deal with America's largest chewing-gum maker. A combined Mars-Wrigley entity would overtake Cadbury Schweppes as the world's biggest confectionery company. Shares in Wrigley rose 23.5 per cent to $77.13 after the $80-a-share cash deal was announced. Mars is offering a substantial premium for Wm Wrigley Jr, which had a stock market value of about $17.3 billion at Friday's $62.45 closing price. The offer price represents a 28.1 per cent premium. Under the terms of the agreement, Wrigley will become a standalone subsidiary of Mars. Berkshire Hathaway, Mr Buffett's investment vehicle, has agreed to provide financing to Mars for the deal alongside Goldman Sachs and JPMorgan, and will take a minority equity stake in the Wrigley subsidiary. Mr Buffett is well-known for his preference for strong consumer brands; however, he usually embarks on acquisitions without a partner. 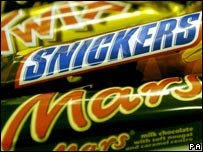 Analysts said that if the deal went ahead, Mars would be the biggest player in the global confectionery industry with a market share of 14.4 per cent, overtaking Cadbury's 10.1 per cent.